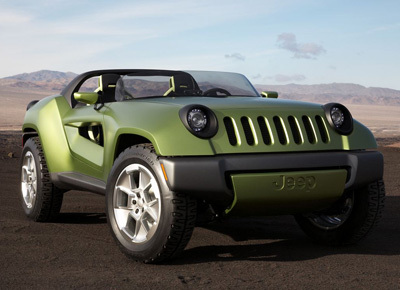 The Jeep Renegade concept was displayed at the 2008 Detroit Motor Show. 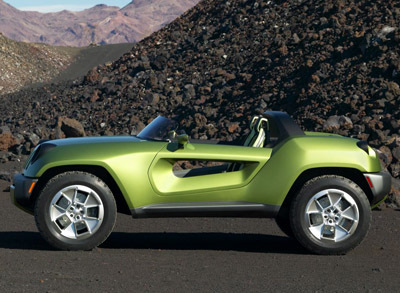 The Renegade concept is powered by a new electric drivetrain which Chrysler put in two other concepts shown at Detroit. The system is called ENVI, and in the Renegade concept it comprises of two 268 horsepower electric motors (one on each axle) powered by lithium ion batteries. This is backed up by a Bluetec diesel engine giving a combined mpg of 110 miles when used with the electric motors. 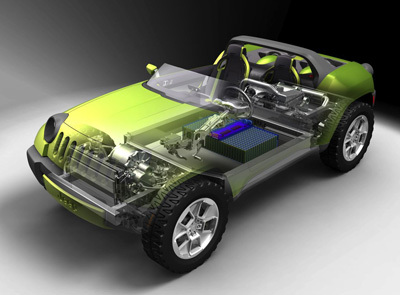 Constructed from environmentally responsible materials, sustainability is a key theme of the Jeep Renegade concept. The one-piece molded chassis was created without using environmentally-harmful resins, inside are soy-based foam seats, and the no-gloss exterior color of the Renegade's lightweight composite body is molded in to avoid the use of solvents present in automotive paints. The Jeep Renegade concept's "one-with-nature" personality is emphasized by its large, flaring wheel openings, oversized wheels and tires, and cut-down speedster windshield. Among the unique exterior details of the Renegade are "deconstructed" rubber-clad headlamps and taillamps, as well as elongated triangular openings in each of the two sculpted doors. 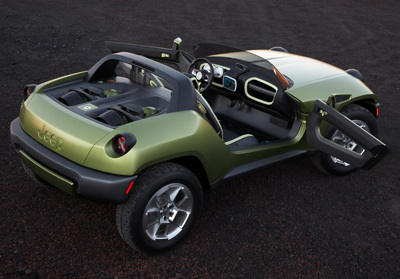 While the Jeep Renegade concept features a roll bar, it has no top. Instead, the cargo deck just behind the cockpit can be fitted with a variety of "lids." Options include a plain lid, or lids configured to accommodate the gear of a particular outdoor day-trip activity, such as mountain biking or kayaking.